This is a low growing clump forming species and Dampiera linearis is available in a number of named cultivars. 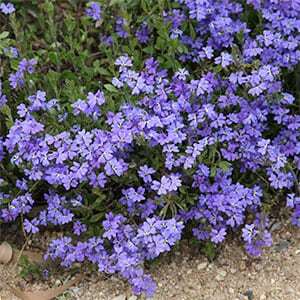 It is variable in flower colour from mauve through to blues and purples. It also varies in height however growth habit and care is the same for all varieties. 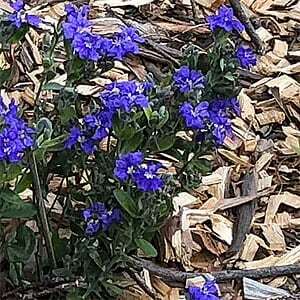 This is great plant as an addition to the native garden, general garden border or for mass planting as a ground cover plant. This is a natural mound forming plant, is spreads slowly by suckers and forms a dense clump over time. Growing well in full sun to a little shade, in warmer climates some protection from the hot afternoon sun is best. Dig soil over well, remove weeds and add a little compost. In very dry summers some additional water may be required, never allowing the soil to remain wet and soggy. Mulching will help prevent weeds as well as provide the right environment to encourage the plant tp spread. Light pruning can keep the plant a little more compact, however it is not generally required. Height – To around .5m. Spread – To around .5 metre to 1 metre. Flowering Time – Mid Spring however through the year in good conditions. Foliage – Grey/green and slightly toothed.